Le Bernardin's office building location, named the Equitable Center at the time the restaurant signed its lease, showcases American art and made it a condition of the lease that artwork be hung in the restaurant. The owners complied, and with a beautiful touch. Paintings from two centuries, most of which are reminiscent of all things seafood -- fish, French fishing villages, ingredients and the sea -- decorate the walls in the dining room and upstairs in the salon. Upon entry hangs a painting by 20th century Mexican artist Abelardo Favela, called "La Varca Verde," which means "The Green Boat," features a man, woman and dog in a small green boat on the water. A 19th century painting of a fisherman overlooks the bar. 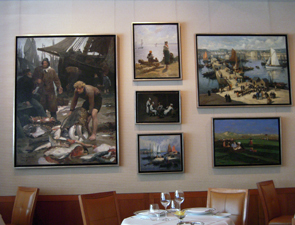 In the dining room, one wall is covered entirely by a long painting of le Port de Boulogne, a fishing port in France, while the far wall features six paintings in various sizes, including works depicting the Port of Concarneau, fishermen, women with fish and young chefs playing cards. Although beautiful, each of these paintings focuses on muted tones so as not to overshadow the beauty of the room. The nook of the back room houses a large, more colorful picture of a family by Mexican artist Abelardo Favela. Upstairs in the salon, where the decor has a much more vibrant flair, artwork consists of images of fish and other ingredients from Eric Ripert's second cookbook, "The Return to Cooking," by Columbian artist Valentino Cortazar, as well as pieces by Abelardo Favela, such as "La Playa," which is of a woman and dog by the beach. No matter what hangs on the wall or how beautiful the room, the real star of the show at Le Bernardin is Chef Ripert's award-winning cuisine. The menu, which ranges from almost raw to barely touched to lightly cooked, may seem simple with its straightforward names, such as "Tuna," "Salmon Caviar" and "Bass-Langoustine," but the cuisine is anything but. The Tuna, for example, includes such special ingredients as foie gras while the Salmon actually includes organic Scottish and smoked salmon, apple, celery and baby watercress with a jalapeno emulsion. The Skate "au bamboo," meanwhile, is served with cellophane noodle and wood ear mushroom in a spiced bamboo broth, demonstrating the depth and breadth of the chef's mastery. Everything is elegantly prepared and lovingly plated. 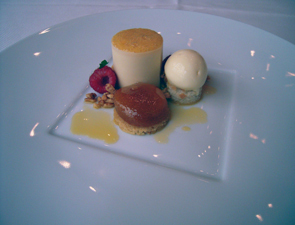 It's pure perfection, right down to the desserts prepared by award-winning Executive Pastry Chef Michael Laiskonis. As if that is not enough, in addition to the prix fixed menus, you receive the elegant little touches of light toast with a salmon spread and a pre dessert in the form of an egg shell filled with milk chocolate cream, caramel, maple syrup and sea salt, each more refreshing than the next. Speaking of refreshing: The bottled water is actually taken from Le Bernardin's own water purification system, "Fresh," and bottled specifically for each table upon request. No detail is overlooked, from purchase to preparation to presentation.